Changing the color of the Hardie Board siding on your house is a relatively simple process. Select a sample of cedar in the shade you wish to match. Generally, cedar has a golden beige color with a light red-brown undertone in the grain. Purchase samples of those colors and paint a small section of your house first to ensure that the colors meet your expectations. Once you are certain of your paint scheme, proceed with painting the Hardie Board. These cedar slats have a golden undertone. Power-wash the entire exterior using the low setting. Allow to dry for 2 days. Repair any damaged areas with an appropriate patching material as recommended by the Hardie Board manufacturer. Sand repairs and any peeling or damaged paint with a medium-grit sandpaper, feathering the edges to blend with the undamaged siding. Wipe with a tack cloth to remove all dust. Roll or spray a coat of flat primer. Select a tint one shade lighter than the light red-brown paint you chose as the undertone of your faux cedar finish. Touch up with a paintbrush around the window and door trims. Allow to dry according to the manufacturer's directions. Roll or spray on a coat of the light red-brown paint, covering all of the siding. This is the darker color of the faux cedar grain. Allow to dry and apply a second coat if necessary to completely cover the primer. It is better to apply two thin coats to avoid paint drips and runs. 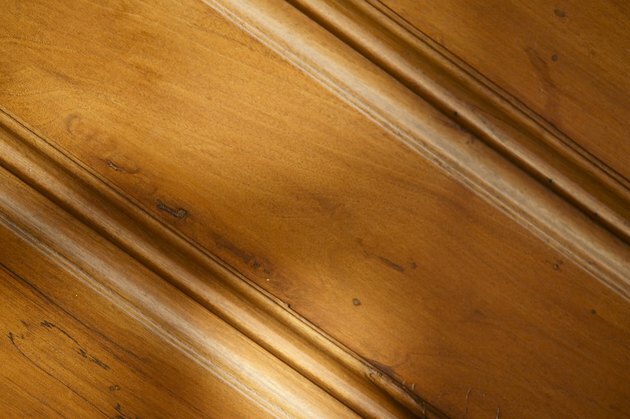 Use a paintbrush to smooth any runs and touch up around the window and door trims. Allow to dry. Pour a small amount of golden beige paint into a paint tray. Apply the paint pad to the paint, scraping it across the edge of the paint tray to remove excess paint. Carefully draw the pad along the grain of the boards, applying paint only to the raised areas. The golden beige provides the lighter-colored grain of the faux cedar boards. Allow to dry completely according to the manufacturer's directions.